Many thanks to the author and to Tracy Fenton of THE Book Club (Facebook) for my advanced copy of this book in return for an honest review. 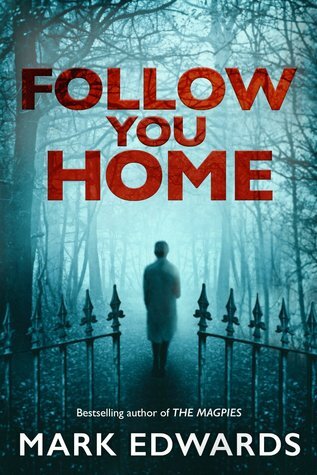 Ask anyone in THE Book Club on Facebook if Mark Edwards can put a foot wrong, and the answer will be a resounding ‘NO!’ His latest book, Follow You Home is proof positive of his talent as a creator of thrilling fiction that you just CPD (Can’t Put Down!). Laura and Daniel are on the trip of a lifetime through Europe; one last big splurge before returning to London to settle down to ‘grown-up’ life. Everything has been meticulously planned, except for having their passports, cash and travel tickets stolen from them on a train-ride through Romania. They are unceremoniously evicted from the train in the middle of nowhere. It’s night-time: dark, scary and impossible to navigate, until they unexpectedly come across a house and have the most terrifying experience of their lives. Back in London they make a pact never to speak of what they witnessed in Romania. Until strange and inexplicable things start happening to them, and they are forced into circumstances they never could have imagined. Edwards is a master at drawing us into the lives of his characters. Daniel is a fairly uncomplicated person who just wants to live a simple, happy life. He is not equipped to cope with what he’s going through, although he does prove his mettle quite capably. He’s a very likeable guy. In comparison, Laura is quite a complex individual who had a challenging childhood and who quickly falls back into long-buried habits when faced with an unimaginably horrible situation. All of the supporting characters are well developed, their roles and purposes clearly defined, regardless of how peripheral some of them are. This is a page-turner par excellence! With twists and turns that are impossible to anticipate, including a depiction of Romania that will send chills down your spine, the author skilfully interweaves the perspectives of all his characters. It’s done at just the right pace, in Goldilocks style: not too quickly, not too slowly, but just right! Follow You Home is due for release on 30 June 2015, and it’s well worth the wait!